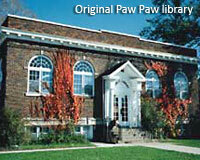 As late as the time of World War I, the village of Paw Paw had no library. This was not unusual for small towns across the country, which is why Andrew Carnegie began his program to promote the growth of libraries in the United States. On January 25, 1917, the Paw Paw newspaper announced that Mrs. E. H. Harvey had offered the large and well-selected private library of her late husband, the Rev. E. H. Harvey, to be used as a nucleus for a public library if a suitable building were erected and used for library purposes. With encouragement from community leaders, a forward-looking village council submitted an application to the Carnegie Library Foundation Fund for an endowment for a building. The application was sent on February 19, 1917. A Carnegie grant of $10,000 was awarded to Paw Paw later in April 1917 (the final year that grants were awarded). Mrs. E. H. Harvey employed a specialist to catalog and acquire more than 1,000 books for the library. Mrs. William J. Sellick also offered to donate $3,000 for a suitable site for the building in memory of her husband, as well as donating his private library and $500 for upkeep. There was also support from the members of the Coterie Club and other organizations and public-minded citizens. Due to war conditions, building costs had risen so the village agreed to contribute an additional $4,500 for construction costs. The Carnegie building, located at 129 South Kalamazoo Street, was used as a library until August, 1991, when the library operation was moved to its new site at 609 West Michigan Avenue. The square footage of the building is three times as great as the Carnegie building and includes space for patron parking. 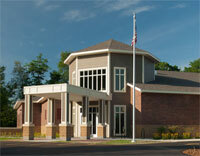 In 2012, a new facility twice the size of the former building was erected in the same location. The 16000 square foot building contains a larger program room to better accommodate community events and library programs. With its brick exterior, it was built to resemble the look of the original library in the Carnegie Building.